Thanks to Steven Tolson FRICS, chartered surveyor and past chairman of RICS Scotland, for this guest blogpost – an examination of land and housing in Scotland, outlining what needs to be addressed to increase housing delivery. Steven’s thoughts are timely, given the recent publication of the Review of the Scottish Planning System. “As a housing practitioner, I think there are three things to try and address to resolve the housing situation that we find outselves in. First, how to increase the supply of housing; second, the power of land ownership; and third, how land value might be captured for public benefit. My opening proposition is simply we can’t expect to increase housing supply by just increasing production from big firms – we need wider and smaller participation. As Pete Seeger once said, ‘the world can be fixed by doing lots of little things’. With many people having problems accessing accommodation, it is hardly surprising that housing is now higher up the political agenda. Politicians regularly seek to outbid each other on the number of houses they are going to build. However, it is certainly not just about numbers: we need to address the type of housing that we all want to live in. The debate often features home ownership and its impact on housing supply, creating value and wealth for some and inequalities for others. It is not just land ownership that has a material influence on housing availability and price. A wider examination is required about the interaction between the functions of the market, the State and how we, as individuals, influence these two sectors. We live within a capitalist system which, in theory, can only work properly if markets operate freely. Adam Smith talked about the requirement for ‘competition’ to allow markets to operate, but the approach over the last 30 years or so has seen the erosion of ‘competition’. With a huge loss of small builders, delivery is now vested in fewer larger firms who inevitably have greater power and influence. This is David and Goliath capitalism. The State has the ability and choice to exercise power and shape markets through regulation, whether that is policy or tax. Some economists argue that until house transactions are all subject to capital gains tax then the housing market will always be vulnerable to volatility and contribute towards inequality. However, it is inconceivable that politicians would introduce what clearly would be such an unpopular measure. Many economists have written about the generation of wealth and inequality in the context of physical assets, including land ownership. Historically, agricultural land ownership brought great wealth and power, until wider competition from food suppliers reduced land values. Now land owners fortunate enough to live within close proximity to an urban settlement can obtain substantial gains as a result of the planning system granting change of use from farming land to housing land. However, it is the State’s power to change the use of land that creates such value. A key question is: given that land values have substantially increased as a result of a public permission, what amount of that increase in value should be shared for public benefit? Many argue that in the last 40 years the State has not really taken a sufficient share of the gain arising from the benefit of a planning permission. Governments have tended to avoid the use of a property tax or local development charges to capture enhanced values, preferring to rely more on so called ‘planning gain’ policies to help fund some local infrastructure, amenities and land for affordable housing. Such policies often lack clarity, allowing scope for negotiation which creates delays in the process. A development charge that captures a proportion of the land value could provide clarity, enable housing to be built quicker and provide funds to build more local infrastructure and amenities. Planners are regularly challenged on the clarity of their policy directions for allocating sufficient housing land for development. 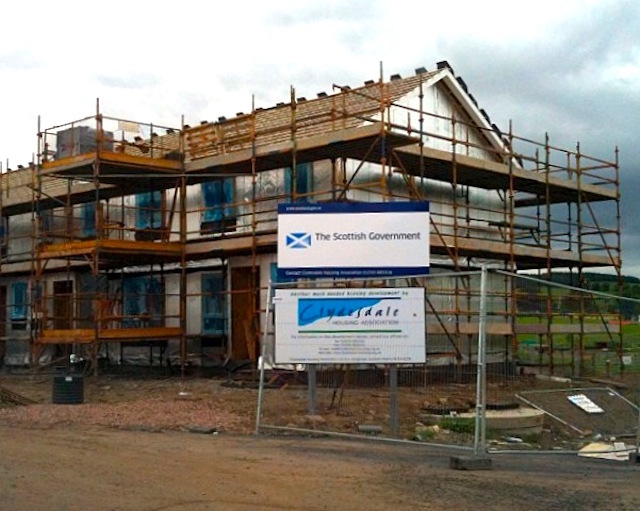 For example, given that housing is a number one priority for national politicians, the Scottish Government’s National Planning Framework is strangely quiet on housing supply. To gain clarity and certainty, planners, with political support, must work more collaboratively with communities and business to identify and co-produce plans for the right sustainable locations that are well connected, so that we can provide the right type of housing to meet all our people’s requirements. Clear decision making should come from an agreed plan rather than speculative opportunism through what is currently an adversarial process. Our continental European neighbours successfully deliver such a process through mixed co-production from councils, market players and communities. Their approach is through multi participation from smaller and larger interests who build at various scales such as individual self build, housing associations, co-operatives and developers to provide greater choice for younger people, families and older people. In the UK, councils, community bodies and land owners can step forward to become prime movers acting as investors to enhance their asset value and create better sustainable places. This is not new, with public projects such as the development of our Scottish New Towns and the regeneration of the Gorbals showing that such approaches have been previously successful. This is not an argument for grabbing land from private interests but it suggests that land value gains could be shared more evenly. It is also about having development delivered through multi participation of both big and small players to create more houses and wider choice.